And when you can’t “put right” a mistake you’ve made, it’s simply because it was a bad decision that life won’t allow you to forget… Forgetting will leave the door open for you to make the same mistake again, inevitably. To live life is to grow, learn, and better ourselves through experiences. New experiences in life are never explored grounds; they require you to be cautious, thoughtful and wary of “the outcome” but at the same time, welcoming of the potential lesson. Life is a scary place that can only be made safe by the way we make decisions and the paths we set for ourselves. For me, a mistake is something you did without intention. It’s the result of a decision you’ve made, as you were put in a position to make a choice. Options are presented and to the best of your ability, you’ll try to make what you feel is the right decision. Mistakes are situations that you find yourself in, that generate an outcome you had no control of. You had no proclivity in the said action that caused an undesired result and because you are not your mistakes, you can learn, grow and bounce back from that… Society will accept and know the authenticity of your admission of a mistake. When ill feelings are used in your decision making process, or when the complete knowledge of the harm your actions could result in is evident, or when knowing right from wrong, you still chose to do wrong… You can no longer label it as a mistake… Life won’t allow it! 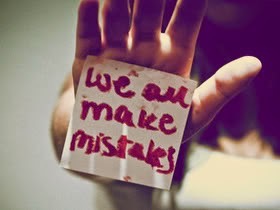 So the most important lesson in all of mistake making is that every one of us makes mistakes, every day of our lives. It is to trust that while mistakes are inevitable, if you can learn from it, no matter what happens, you’ll be able to get value from it and apply it to the betterment of you. And you? What is your point of view? What's your take on this?